When I started putting together a plan for the year, with a goal of focusing on one park and issue each month, I was thinking July would be Denali — partly because I’ve never been to any of Alaska’s national parks, partly because Mom wanted to go there. She has been taking a trip to a national park each year with a group of girlfriends. But for 2012, they couldn’t agree on a place. Mom’s friends wanted to go the Everglades. She already had been there. She wanted to go to Denali. Her friends didn’t want to. So they were going to take a year off. I mentioned this to Dayton Duncan, the writer behind the Ken Burns’ documentary, when I went to New Hampshire last fall to meet with him. And I remember he held up his hands, smiled and said something like, “So you’re going to Denali with your mom, right?” He was right. It was like it was meant to be. And so I called Camp Denali, a lodge at the end of the road into the park, and started to make plans. The folks there were beyond welcoming. I was starting to think July, with a trip to Alaska, was going to be one of the best months of the year. And then, of course, came Mom’s diagnosis in February. She kept saying she wanted to go to Denali in the summer. I quickly realized this wasn’t going to be possible. I told her that she needed to focus on her treatment and that we’d go another year. Then I quickly realized that wasn’t going to happen. I thought about all of this while lying in my tent, set up in a wooded area on an old airfield in Brooklyn, part of Gateway National Recreation Area since 1972. Why am I here? Why am I camping a city where the heat index topped 105 the day I arrived, with the worst mosquitoes I’ve experienced all year, with the sound of jets from JFK roaring over my head every few seconds in the middle of the night and the rumble of sanitation trucks in the morning? I could be in any national park in the country. Glacier, Crater Lake, North Cascades, Zion. Why did I choose to come to New York City? Why did I stick with these plans even after mom died June 30? Why didn’t I go all “Into the Wild” and head to some remote place? I was ready to bail after that first night. I’m glad I didn’t. By the end of six days and five nights camping in New York, I was more than ready to get on a plane and come home. But Gateway — and especially the people I met there, from the rangers to the fellow New York campers — made me think about a lot of things in ways that few other places could. Let me backtrack. I had never heard of Gateway until last fall. (And I’m hardly alone. Throughout my time there, New Yorkers kept telling me they had never heard of it.) Gateway ended up on my radar partly because when I went to Washington D.C. last fall, some of the National Parks Conservation Association staff I met with suggested including it in my journey. 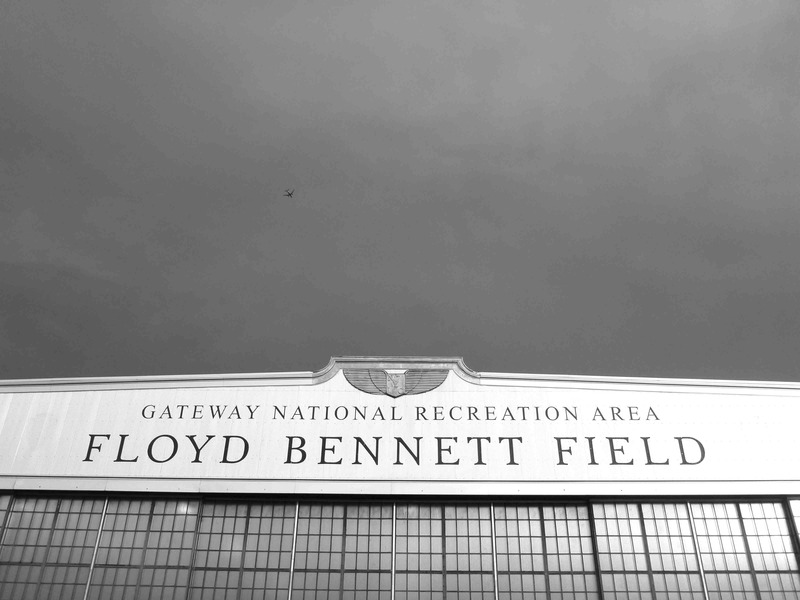 It was established the same year as Golden Gate National Recreation Area. But while Golden Gate quickly became the “how to” example for urban parks, Gateway became the “how not to.” The NPCA folks said it had such potential, but that for years it had been underfunded, neglected and, at times, mismanaged. They said it was both beautiful and a mess. And they were right. Camping there was a challenge. In many ways, it was more of a challenge than camping in Acadia, with a bitter rain beating down on my tent, or in the Dry Tortugas, 70 miles from fresh water and “civilization.” But camping there also was cheap ($10 a night in NYC) and thought-provoking. It forced me to think about urban parks, budgets, the park service buzzword “relevancy” and, perhaps most of all, beauty. For the first few days of my trip, I had trouble seeing much of the latter. I saw all of Gateway’s flaws. Its trash and broken glass and noise. By the end, I still saw (and heard) those things, but I also could see not only this place’s potential for the future, but some of its current beauty. 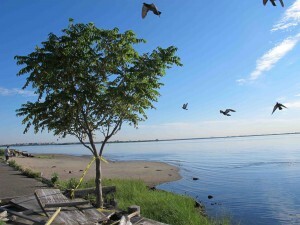 I could see why Dave Taft, head of the Jamaica Bay unit and a Brooklyn native, sees this as an oasis. I could see why the New Yorkers in the recently expanded campground were excited to be there, even with the mosquitoes and the planes. While at Gateway, I ended up with some memorable experiences. And not just the hiking and kayaking. Tagging along with ranger and intern to a Hindu service in Queens. Chatting with old-timers restoring planes in a historic, but rundown hangar. Standing around a campfire and talking about life, war, politics, marriage and vodka with a NYC cab driver who, after spending something like 30 nights there, described himself as the Cal Ripken of the campground. (All long stories, which I’ll save for later.) Suffice it to say, by the end of the trip, I think I had the answer to the “why am I here” question. Gateway made me look at the world, and the future of our national parks, in a way that even a place like Denali couldn’t. I still want to get to Denali, though. For now, I’m focused on the next stop: Yosemite — with a quick look at Golden Gate National Recreation Area on the way.